"Can you believe that? A kid from Oakland walking around and believing in fairy tales." Ryan Coogler is 31 years old. He has directed three movies: Fruitvale Station, Creed, and Black Panther. Fruitvale Station was a passion project made on a shoestring budget and a desire to tell a young man's story that was being misconstrued by the media. After dazzling critics, enthralling movie goers, and catching the eyes of studio executives, he was given the chance to take one of Hollywood's biggest franchises in an entirely new direction. The success of Creed further cemented Coogler's place as one of the industry's rising stars and led to Marvel looking his direction as someone who could bring one of their most important and highly anticipated characters to life. Little did anyone know he would seize this moment and transform it into an opportunity to create a beautiful and powerful homage to Africa, its culture, it's people, its traditions, its fashions, its struggles, its strengths, its weaknesses, its history, and its place among the rest of the world. Oh, and by the way, the movie is also one of the best entries into the Marvel Cinematic Universe that we have seen to date. 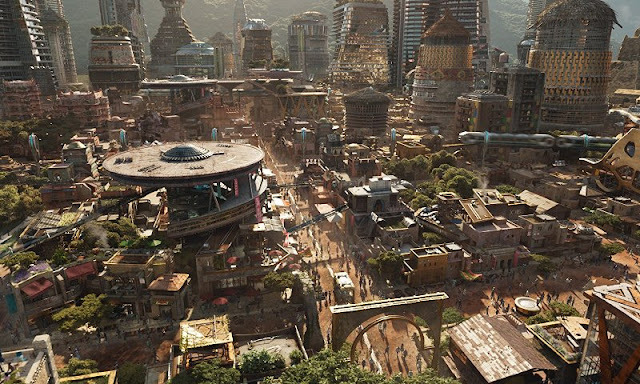 Unlike most recent Marvel films, this one does not feature a multitude of heroes from across the studio's roster. 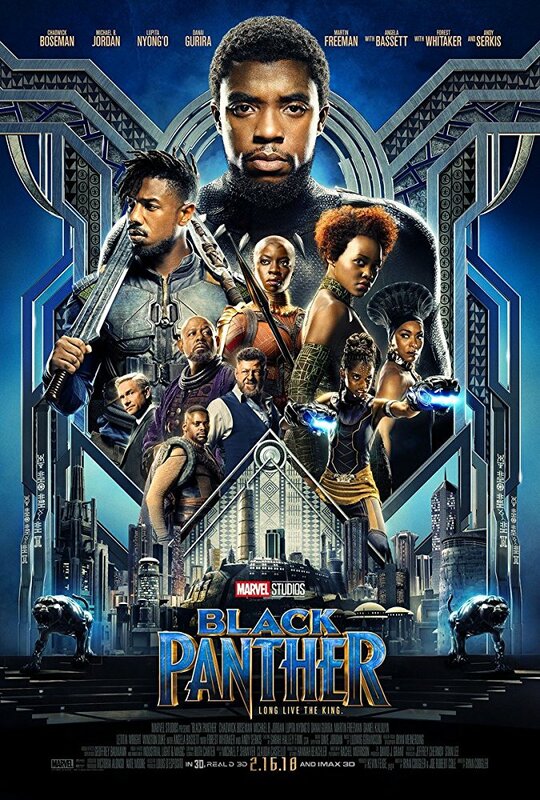 The focus is on T'Challa, played by Chadwick Boseman, and his journey to becoming king of Wakanda after his father's untimely death which we saw in Captain America: Civil War and how his path is interrupted by a mysterious American special ops soldier and mercenary played by Michael B. Jordan. These two opposing forces are destined to clash and I can't imagine how two better actors could have been found to play the roles. Before taking on the role of Black Panther, Chadwick Boseman was primarily known for playing Jackie Robinson in 42, a role which he handled beautifully. From the moment we see him in Civil War, it becomes apparent that he was destined to play T'Challa and his performance in Black Panther is one of the more definitive character portrayals we have seen. Marvel has a knack for casting just the right person to fill their iconic roles and this was certainly no exception. One of the reasons Ryan Coogler has been so successful with the three films he has made so far is because he has teamed up with Michael B. Jordan for each of them. This guy is a genuine superstar with the type of captivating stage presence that was a perfect fit for the role of Killmonger. 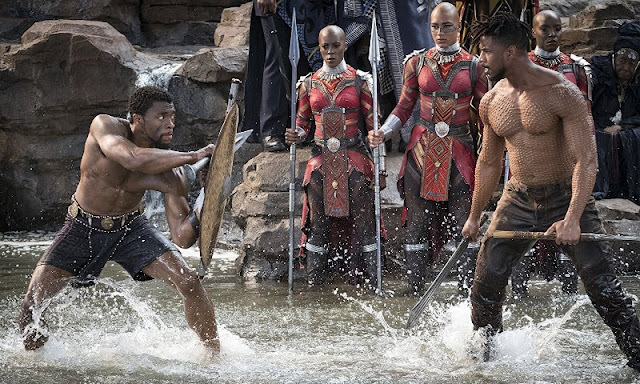 Individually, Boseman and Jordan could have carried the picture, but seeing them both on screen as opposing forces really elevated the movie to a true epic scale adventure. Lupita Nyong'o. Angela Bassett. Danai Gurira. Letitia Wright. These four names alone should warrant a movie of their own, but for now, Black Panther is the title character so they are each tasked with filling the primary supporting roles. While one might choose to label them simply as girlfriend, mother, bodyguard, and sister, these titles would be woefuly underestimating what each of these actresses brings to the table and how they fill their characters with depth, strength, individuality, and identity. This movie would not be nearly as strong and well rounded of a story as it is without the contributions from each of these women. I am really hoping we get to see a lot more from Lupita as Nakia, not just as T'Challa's love interest, but more in a way that explores the duality of someone who has worked both as a covert spy protecting Wakanda and as an ambassador for peaceful communication and sharing between countries and cultures. Also, I would love to see Letitia Wright, as Shuri, integrated more into the MCU moving forward as a way to help Tony Stark transition into more of a support role or even into retirement. In the comic books, a teenage girl who has an off the charts intellect and a knack for inventing new technology, has taken on the mantle of Ironheart under Stark's mentorship. It would be perfect to have Shuri fill that role in the MCU. As with an Marvel movie, the special effects are top notch and everything looks absolutely fantastic. Gone are the days of cartoonish looking characters or unrealistic backgrounds, every frame of this movie is beautifully rendered and well thought out. One of the keys to how amazing the movie looks is due to the talents of cinematographer Rachel Morrison who had recently been nominated for an Academy Award for her work on Mudbound. 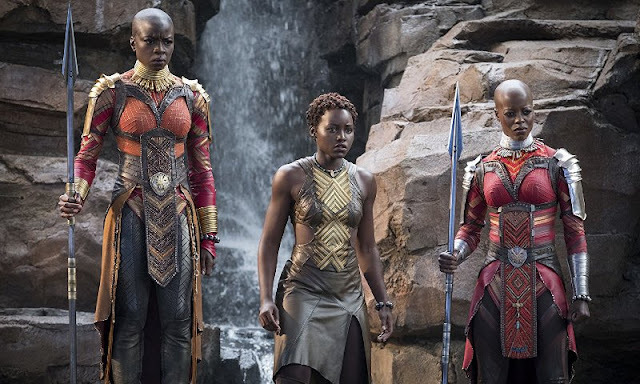 What she does with Black Panther does a lot to move the comic book genre forward while also staying true to the visual pallet we have grown accustomed to over the last couple years from other MCU movies. There is also a ton of focus from the art department to emphasize African cultures in everything including wardrobe, hair styles, dialects, and even in representation from actors native to African countries. I feel like this really helped to authenticate a story that was so unknown and foreign to the average moviegoer as well as giving the audience a truly immersive experience. I wanted to talk more about representation, culture, and how meaningful this movie is for the black community although I don't feel I'm nearly qualified enough to speak on it appropriately. 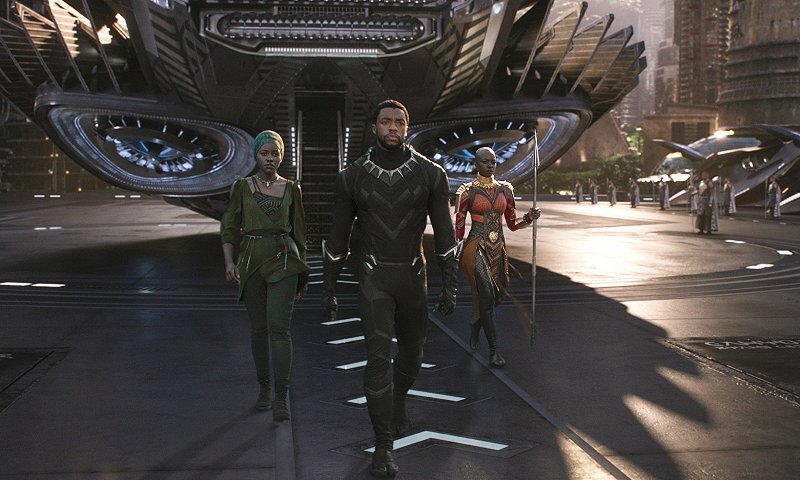 What I can tell you is that this movie is so important on so many levels for people of color to see themselves on screen as heroes, as highly intelligent contributors, as families, as communities, as productive citizens, as expressive individuals, and not just as the basic stereotypes that have been ingrained into American culture for decades. It was most interesting to see Killmonger represent those stereotypes in a very dangerous and toxic way and yet you could understand the anger, frustration, and isolation that got him there to begin with. This was not your average, cookie-cutter villain, this was a man who had been beaten down and had everything taken away from him so he learned to fight back by using his enemy's tactics again them. 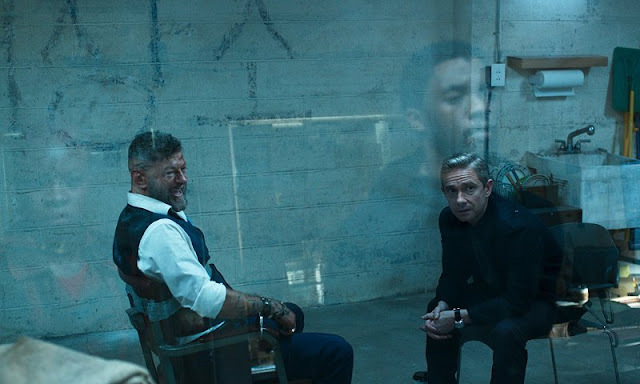 Big shout out to Ryan Coogler and Michael B. Jordan for really going all in on who this character was and what he represented. He is in no way someone to loop up to or admire yet it is easy to see a piece of him in each of us. Before I wrap this up, I have to mention a few more of the actors and the characters they portray. 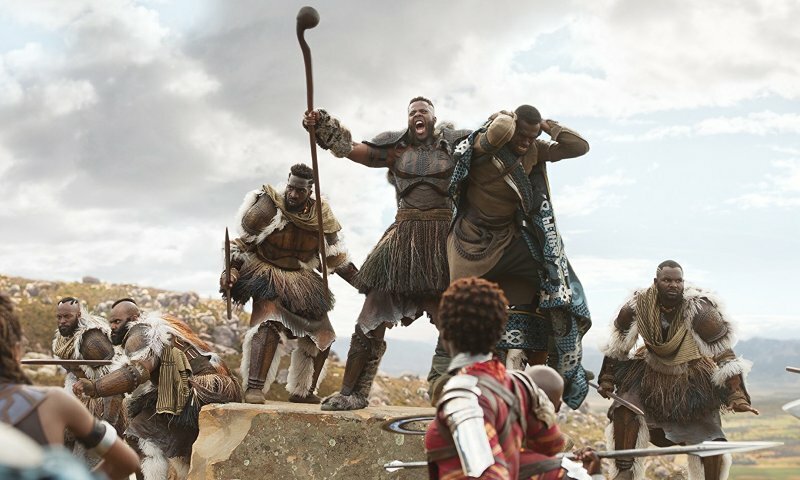 Winston Duke as M'Baku is about as entertaining of a supporting character as you will ever see. He dominates every scene he is in and he gives more than his fair share of memorable moments considering how little screen time he has. Speaking of memorable moments, Andy Serkis is absolutely fantastic as Ulysses Klau and at some point this man needs an Oscar for something whether it's his motion capture work or as a live actor. As much as I like how he brings to life CGI created characters like Caesar from Planet of the Apes, Gollum from Lord of the Rings, or Snoke from Star Wars, I would have to say this is one of the most entertaining performances he has ever turned in. You could tell he had a blast playing the role and it really comes across on screen. 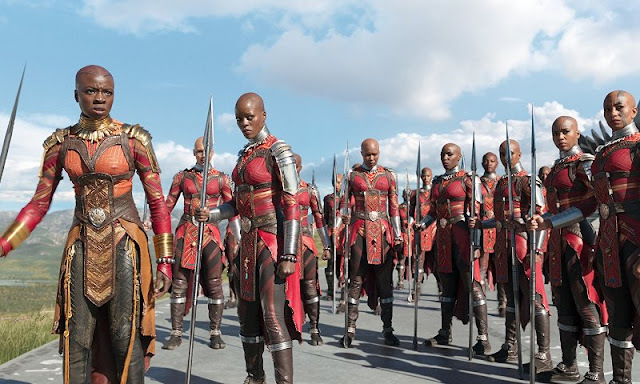 Finally, special shout out to every actress who played one of the Dora Milaje (pictured below). Just seeing you onscreen is an inspiration. Black Panther is not just a great movie, it is a cultural phenomenon. It is important on many levels and tells such a great story while also seamlessly moving the MCU narrative forward. 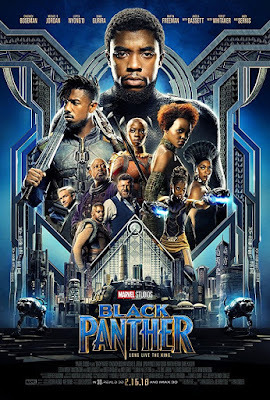 Congratulations to Ryan Coogler and team for creating something truly special and to Marvel for believing in a kid from Oakland who grew up believing in fairy tales.